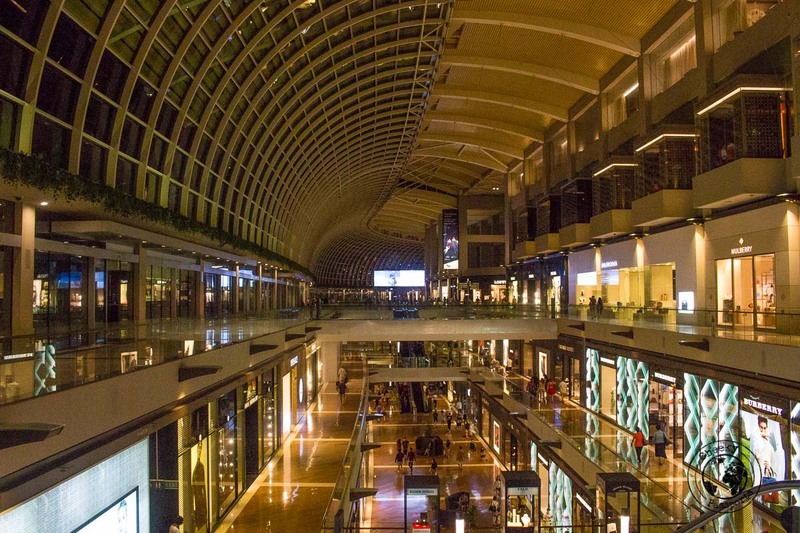 Singapore may be ‘tiny’ when compared to its neighbouring countries, but what it lacks in size, it makes up for in tourist attractions and places of interest. We only spent 3 days in Singapore managing just a few of the most popular activities. 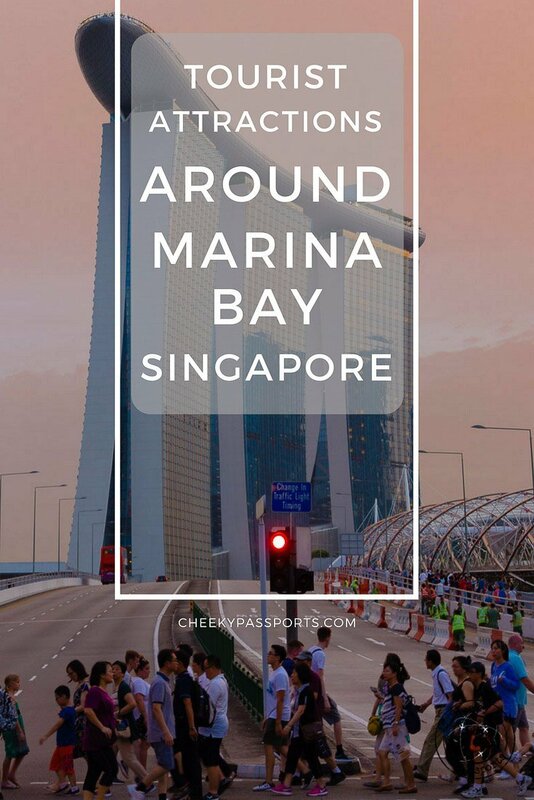 Read on as we take you through our favourite sights around Marina Bay. Having trouble booking flights to Singapore? Try using Nusatrip! Overlooking the Marina Bay and welcoming tourists to the mouth of the Singapore river is the city’s symbol, the Merlion Statue. The statue gives honour to the country’s origins. Singapore was formerly a fishing village and later named ‘Singapura’ roughly translating to ‘Lion City’. 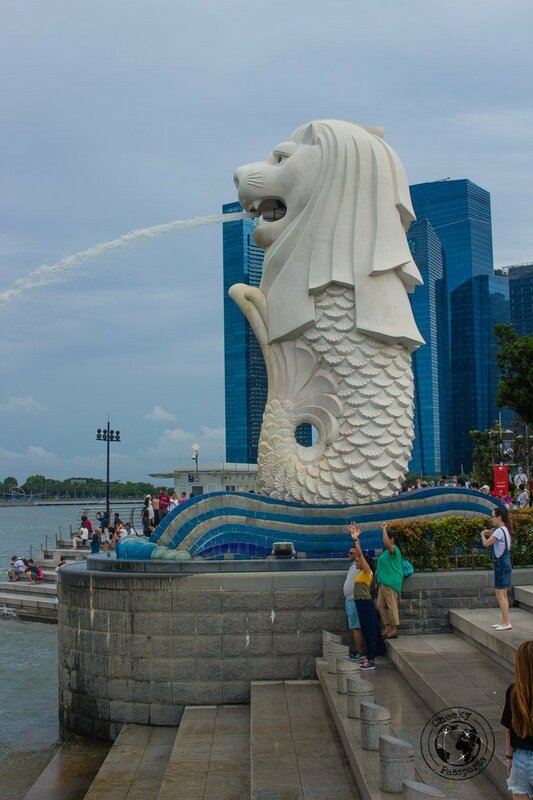 The Merlion is in fact a statue of a lion’s head placed on the body of a fish or perhaps a mermaid. The surrounding park commands a fantastic view of the Marina Bay. 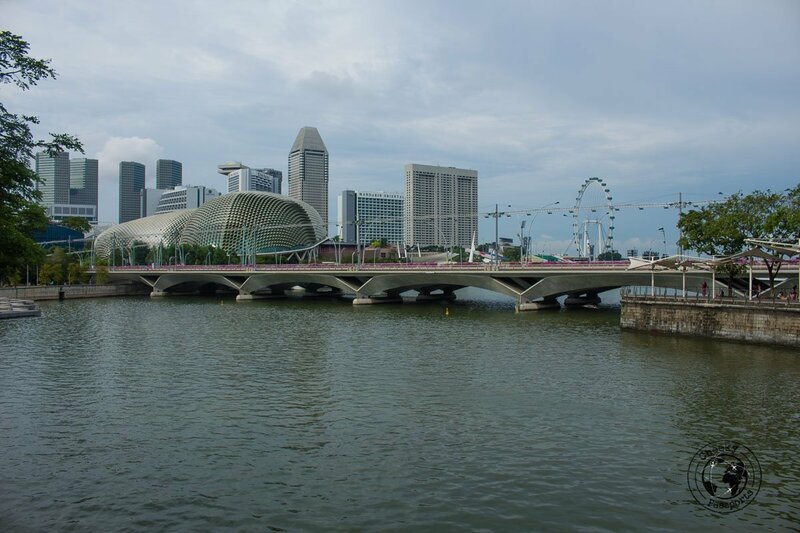 Up front is the iconic Marina Bay Sands Resort, the Art and Science Museum, and the Helix Bridge, whilst the Esplanade Theatre is to the left. It might be a good idea to visit this park by night too, as the vividly lit panorama is stunning! You can get there by stopping at the ‘Raffles Place’ stop along MRT’s East-West and North-South Lines. 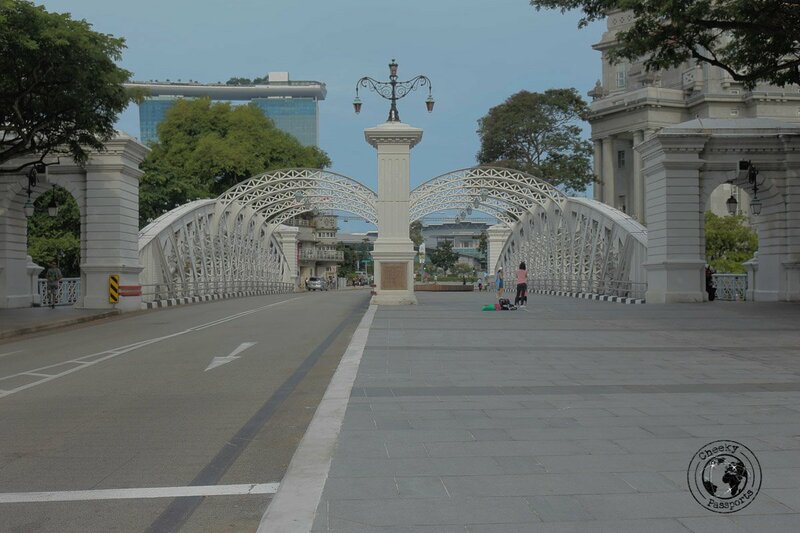 Alternatively, if you feel like a little stroll, alight at the ‘Esplanade’ stop on the Circle Line, and walk down the very picturesque colonial St. Andrew’s road. Be sure to have a look at the Cathedral, the National Gallery, the Victoria Theatre and the lovely Anderson bridge as you walk along this route. 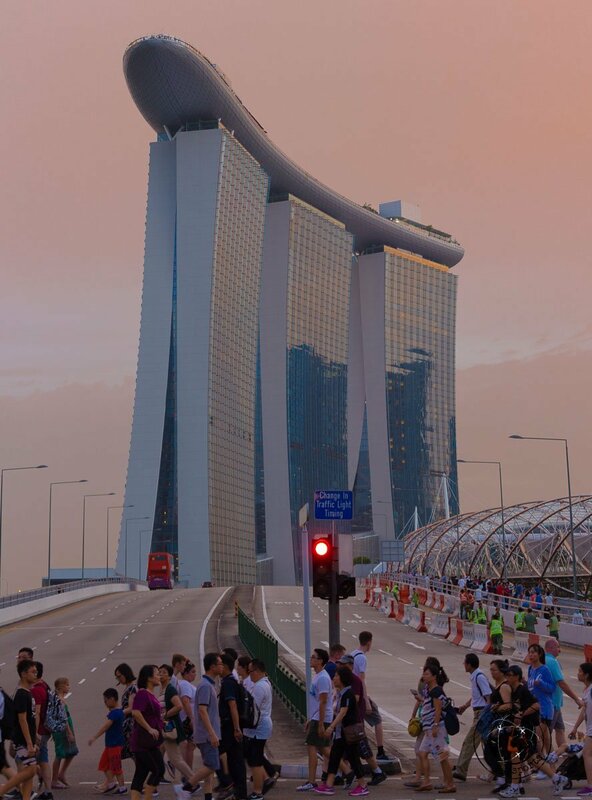 Singapore is undoubtedly a structural engineer’s haven, not only because of the imposing high-rise buildings, but also thanks to various intricate structures decorating the skyline, particularly around Marina Bay. 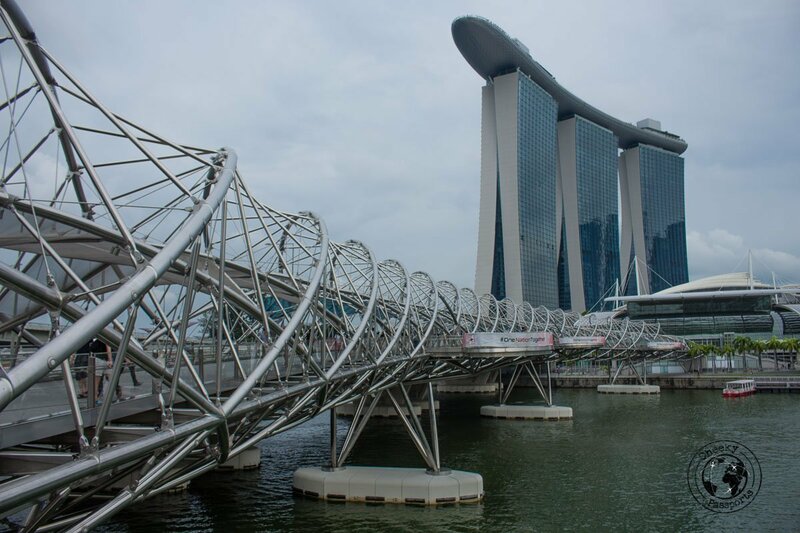 One of my favourite is the double helix bridge designed in the form of…. you have guessed (duh), a double helix. It conveniently leads from the Esplanade/Singapore Flyer side of the river bank to the Arts and Science Museum and the Marina Bay Sands Mall. Michelle was unimpressed. 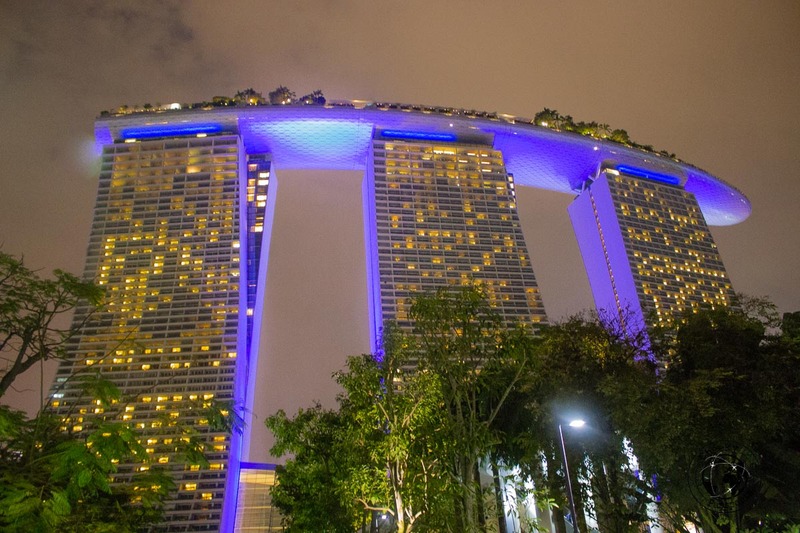 The centrepiece of the Marina Bay is of course the Sands Resort, a landmark easily recognisable by many due to its uniquely designed cantilever one-hectare rooftop in the shape of a boat. Besides housing a well-acclaimed hotel and casino, the premises include two theatres, an ice skating rink and a designer shopping mall. In an attempt to recreate the aura of its older Vegas cousin, the mall has its own indoor lagoon inclusive of “gondolas”. Admittedly, it is not the area’s most inviting attraction (go ahead keep reading ?). What the lagoon lacks is swiftly made up for by the infinity pool on the rooftop. Many have probably heard about the infinity pool at the Sands, especially fans of Instagram where it is featured ad nauseum. Taking a photo in the pool is not cheap though, since to be allowed access, you need to book at least a one-night stay there. 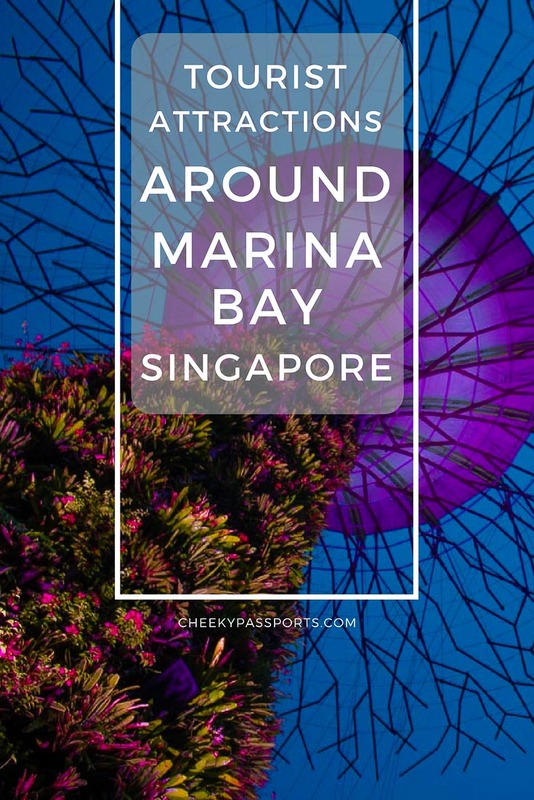 Due to our time and budget limitations we decided to skip this attraction, but if it fits your wallet and you would like to spend a day there, here’s a quick link for you to check availability at the Marina Bay Sands. You can get there by stopping at the ‘Bayfront’ stop along MRT’s Downtown and Circle Line. Dubai, Kuala Lumpur, Barcelona and other major cities all seem to have their own signature melodic water fountain, and all are known to provide a lively spectacle of light, music and water features. Singapore of course has its own fountain to compete, yet it didn’t just stop at an intricate aquatic choreography. 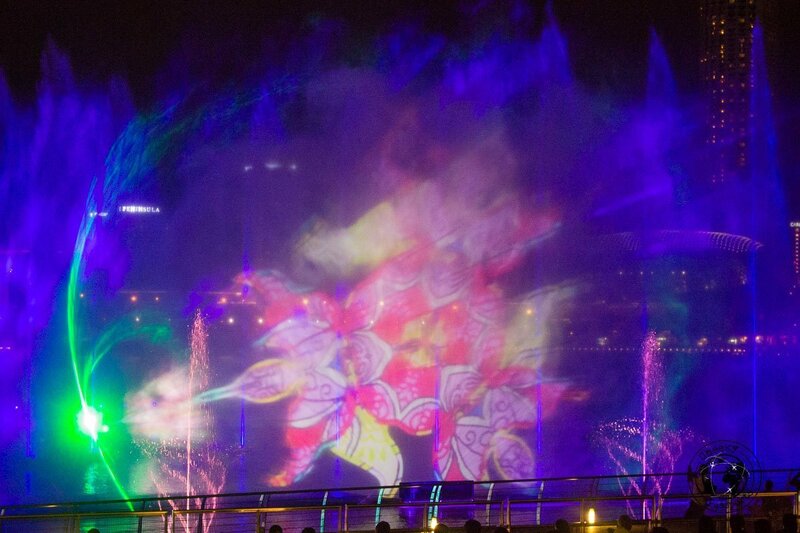 The recently re-designed (formerly known as ‘Wonder Full’), Spectra broke through the lines by projecting a laser show onto a carefully planned misty wall, which is also complemented by more traditional (nonetheless spectacular) water architecture. The show is performed three times a day, the schedule of which should be checked on this page, so as to avoid any disappointment! Its close proximity to the Super Trees would lead you to think that the 15 minutes in between the respective shows would be sufficient to see both. We suggest that you do not put much effort in doing this, as the crowds can be overwhelming, and securing a good spot around Marina Bay at both shows is unlikely, even if you manage to get there at all! What we do recommend instead of rushing away from Spectra, is to hang out in the area a little while longer, and observe the relatively inconspicuous Rain Oculus come to life. When no water is flowing, have a friend go to the opposite side and test the 15 cm perspex wall bowl’s acoustics. 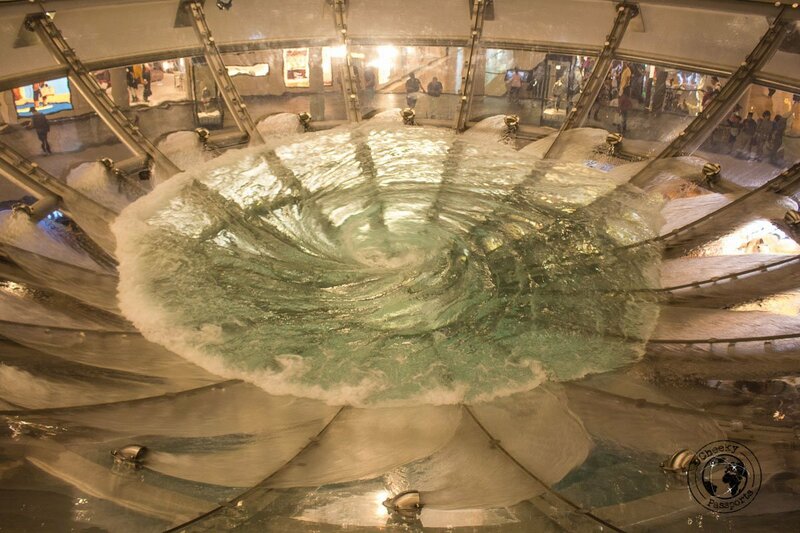 When water starts flowing, notice the huge vortex created around the concentric plug hole at the bottom. Now quickly run downstairs to the mall and see the ten-meter ‘waterfall’ It creates, flowing violently into the internal lagoon. 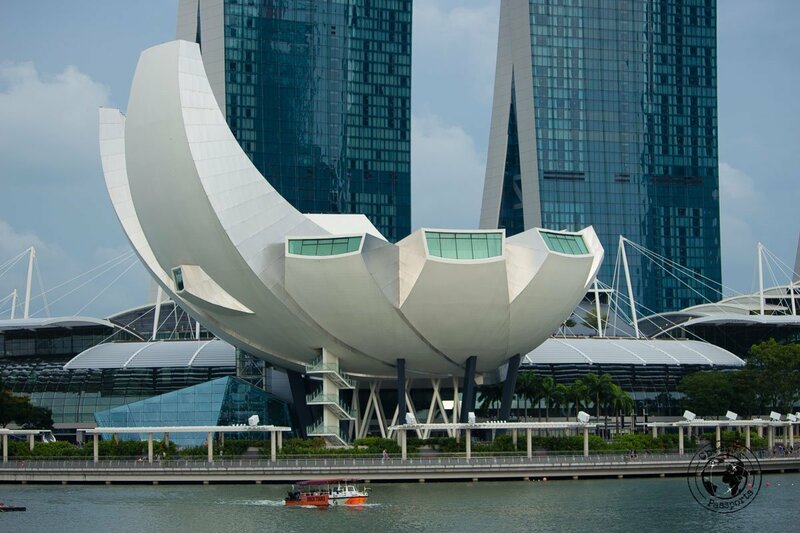 Another great piece of art and structural excellence around Marina Bay! 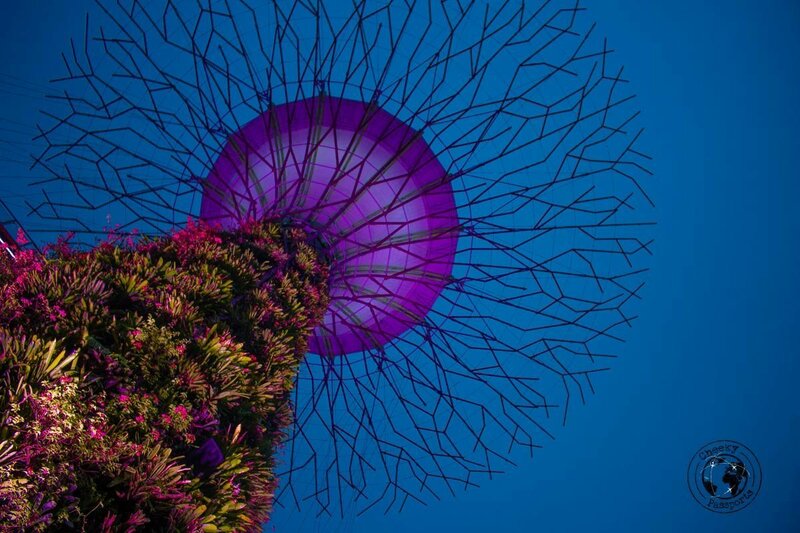 One of the most popular attractions in Singapore, Gardens by the Bay is a huge park built entirely on reclaimed land. The park itself is divided into three separate sections, the Central, the East and the South Gardens. The East Garden is perfect for a peaceful stroll along the East Marina river bank and allows an alternative route to the Marina Barrage viewpoint at the Central Garden. What is really amazing is the South Garden and it’s two glasshouses, or more specifically two huge plant conservatories with a temperature controlled atmosphere. 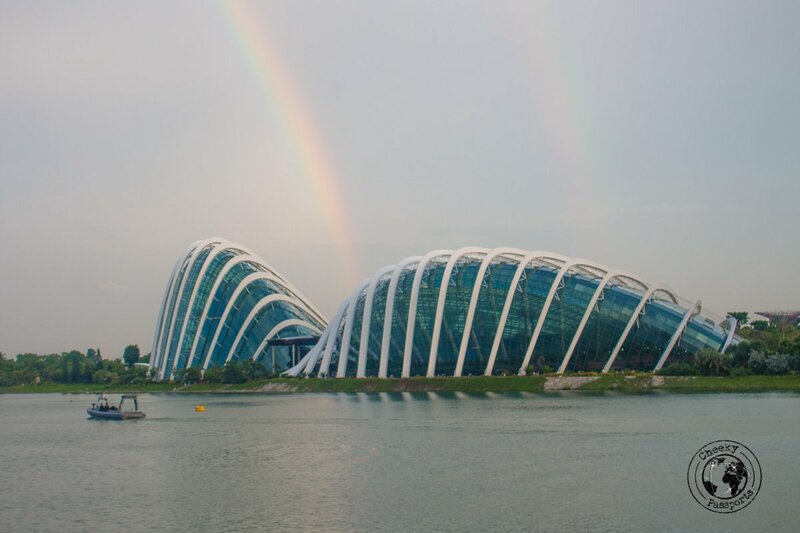 The curved roof structures are a further token of Singapore’s engineering excellence, but not only. Cooling the conservatories is no small feat; massive water-cooled blowers and ventilation systems are employed, all ingeniously hidden away in a nearby attraction … the Super Trees. 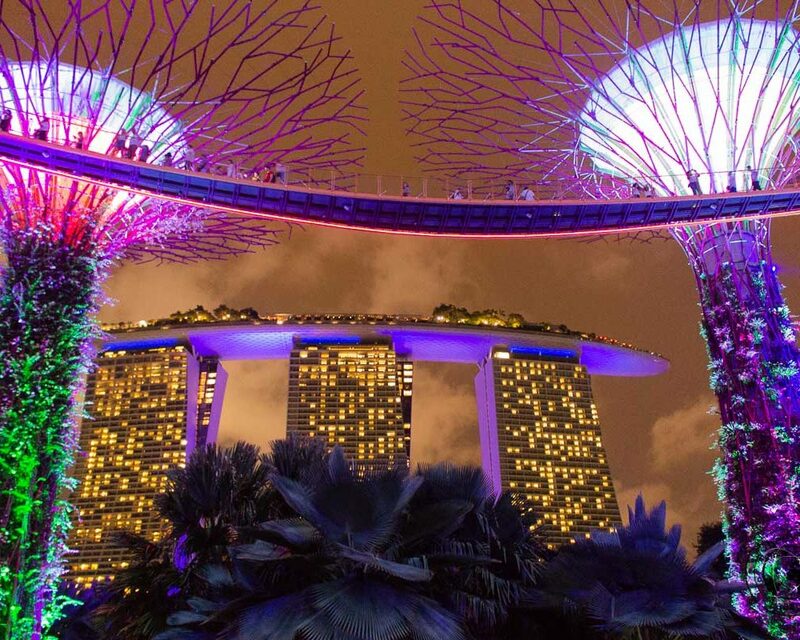 For the less engineering savvy who may not appreciate the intricacy of the design, the vibrantly decorated Super Trees around Marina Bay represent a fantastic selfie opportunity, and the colourful light show called Garden Rhapsody, is one of the most popular free attractions in Singapore. Show times at 19.45 and 20.45 daily, but better check for any updates on the official website. Being a full-time traveler teaches you a great deal about budgeting (though Michelle is not very convinced that I have learnt enough as it is). As much as we would have loved visiting the Universal Studios Theme Park whilst also spending a day at the Sand’s infinity pool, our budget did not cover these activities. We do however like the occasional expensive treat, and trying out an actual Boeing 737 simulator was too alluring for me to resist! Singapore may be a city full of lights, yet hidden around Marina Bay is an attraction which is pretty unknown and unique. 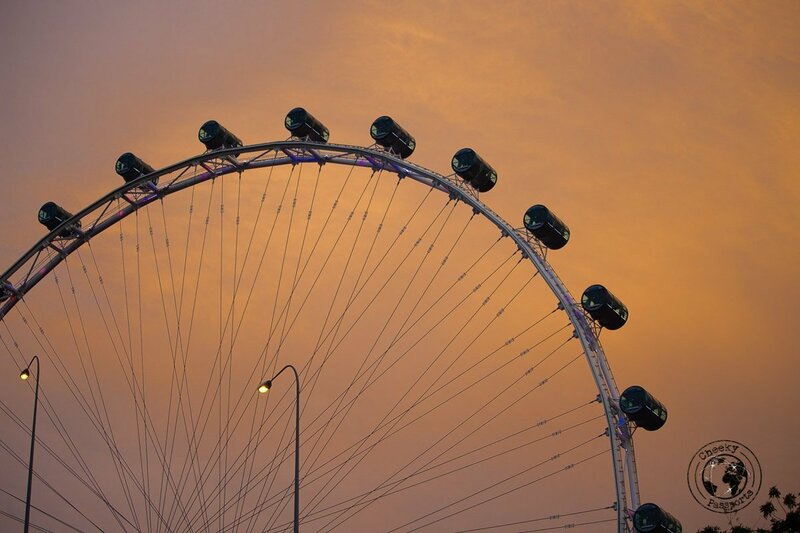 Conveniently located at the second floor of the Marina Flyer building, home to the giant panoramic wheel, is an outlet called Flight Experience Singapore. As the name implies, this is an authentic flight simulator, accurately mimicking an older Boeing 737-800 model up to every inch of its design. The shop, which is licensed by Boeing, offers multiple packages catering to people of different experience (or lack of). The most basic of packages includes a pre-briefing tutorial which takes place prior to your getting near the plane’s controls. You are at liberty to choose which runways to land and take off from, and the design details of the airports are pretty accurate, especially for the more popular ones like Kai Tak, the former Hong Kong airport! Throughout your experience you will be accompanied by an instructor (an actual licensed commercial pilot) who will guide you and set up the difficulty level in accordance with your preference and experience. One word of advice, the imagery is so authentic that it might make you feel sick at times! 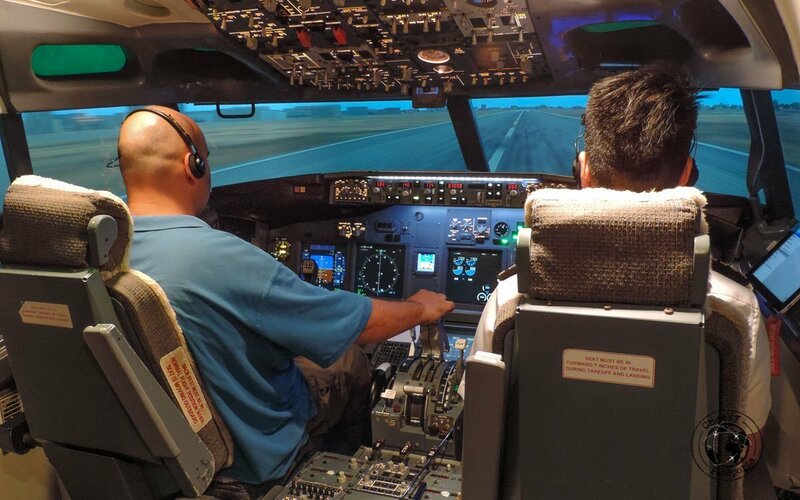 Although it is one of the cheapest authentic simulators you can experience in the world, with prices starting from SGD $175 (about €110), the attraction is not for the budget traveler unless you’re really really keen! You can also purchase a DVD of your experience to show your family and friends! You can get to the Marina Flyer by stopping at the ‘Promenade’ stop along MRT’s Downtown and Circle Lines. Great post! I’ve been to Singapore already, but this brought back so many good memories. Thanks for the share.